Download our Tag Scanner program, to create a tag – Race Number mapping file. The File then can be imported into your timing software. 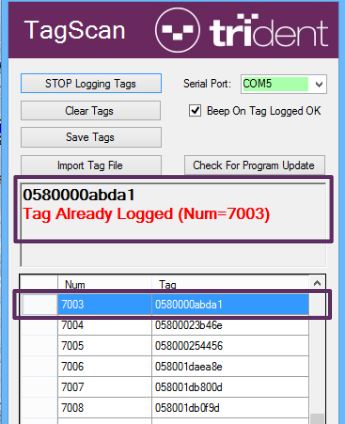 Previous Tag scan files can be imported to use as a checking system to see what number has been assigned to a tag. Current Version is V1.4.0.12 . 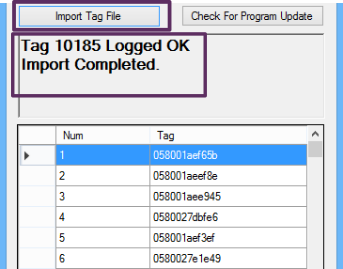 If you have TagScan installed , select the ‘Check for Program Update’ button. If you computer fails to find the required driver automatically you can click on this link to go to the manufacturers download centre to choose the correct driver for your version of windows. 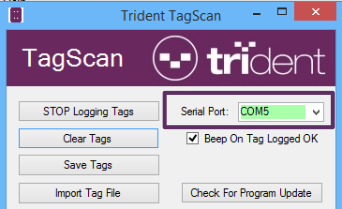 Plug in your Trident USB Registration reader. Select the USB Registration reader serial port from the list. Scan tags into the mapping list by passing tags over the USB Registration reader. Last tag scanned is added to the bottom of the mapping list. Click the ‘Save Tags’ button to save the scanned tags to a file. Import the saved tag mapping file into your timing software as required. To delete a single tag from the list, select the row and press the delete button on your keyboard. To Change the numbering start value. click in the “Num” field of the last scanned tag and edit to the desired start number. Tags scanned after this will carry on from the new value. Select the ‘Import Tag File’ button and browse for your file. File will Import and show the number of tags imported. 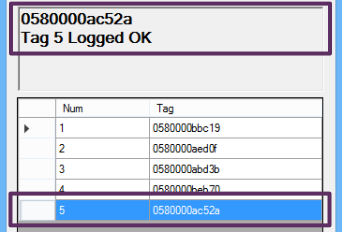 When a tag is scanned and the tag ID is contained in the file, the Number associated with the Tag is shown and record will be displayed. Copyright © 2015 Trident RFID Pty Ltd.